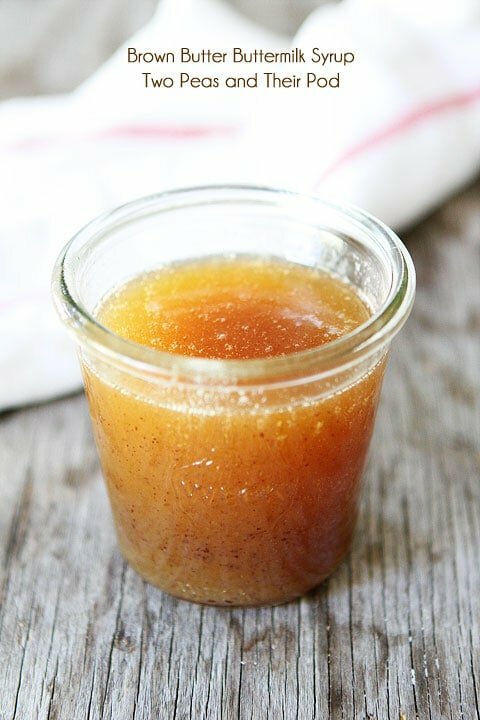 Brown Butter Buttermilk Syrup-the most amazing syrup ever! Pour it over your pancakes, waffles, French toast…or drink it by the gallon! I thought Buddy’s syrup obsession was an elf thing, until I made this Brown Butter Buttermilk Syrup. I am now with Buddy! I believe Brown Butter Buttermilk Syrup needs to be one of the four main good groups! If you’ve had buttermilk syrup, you know it’s heavenly. It is the queen of all syrups. Well, let me introduce you to the KING of all syrups. 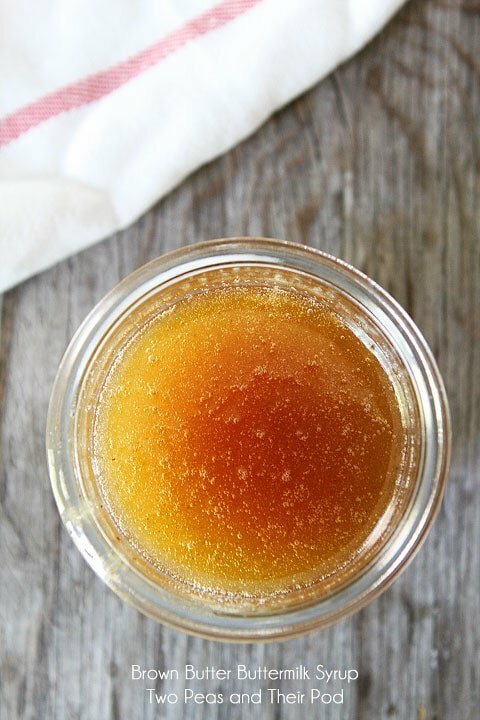 Brown Butter Buttermilk Syrup is the cream of the crop! It is the the best syrup I have ever had. The brown butter takes it’s goodness to a whole new level. It is good poured on waffles, pancakes, French toast…and maybe even spaghetti. I haven’t tried it yet, but I now can relate to Buddy. This syrup would be good on anything! The next time you make a special breakfast with pancakes, waffles, and French toast, include Brown Butter Buttermilk Syrup. It is life changing! It will bring out your inner elf. Don’t be surprised if you start drinking it straight from the jar! 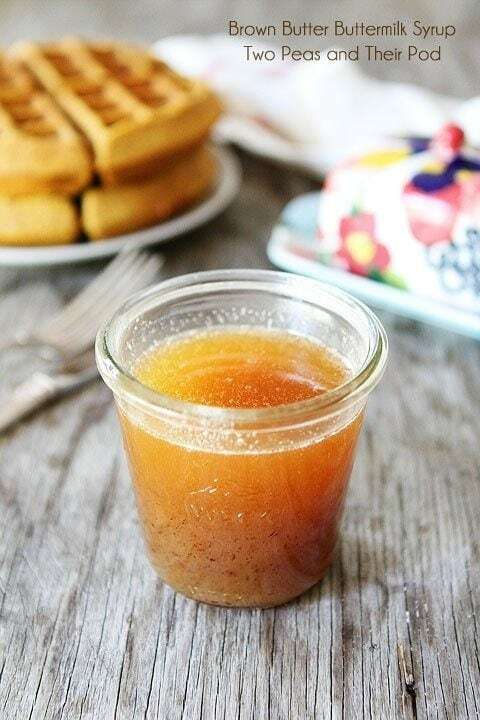 Brown Butter Buttermilk Syrup is our family's favorite syrup. 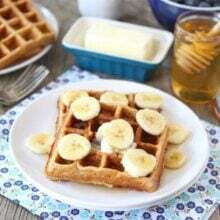 It goes great with pancakes, waffles, or French toast! 1. In a small saucepan, melt the butter over medium-low heat and continue to cook, swirling occasionally, until butter turns golden brown, Skim foam from top, and remove from heat. Pour into a bowl to stop the cooking, leaving any burned sediment behind. 2. Combine browned butter, sugar, and buttermilk in a large saucepan. Heat over medium heat and whisk together until sugar dissolves. When butter mixture starts to boil, carefully whisk in the baking soda and vanilla. The mixture will bubble up, so make sure you use a large saucepan. Serve with waffles, pancakes, or French toast. Note-syrup will keep in the refrigerator for up to 2 weeks. Reheat before serving. Ive always wanted to make this stuff! I think I’ve seen it on Nikki’s site (chef in training) and also Ree? I dunno – somewhere I’ve seen it and have almost made it but just never have and you I think just convinced me. Pinned! Can I use clarified butter in this recipe? Would it improve the syrup or would it just not work at all? Yum!! I have never heard of brown butter buttermilk syrup. It sounds fantastic!!! Have to bookmark and make this weekend! Browned butter syrup??? I think I’ve died and gone to heaven. Oh, my Yummy….got to make this. Have made regular buttermilk syrup and thought it was to die for – this must be over the top Good. This syrup is AWESOME! Brown butter and buttermilk! Yeah, I could drink that! This is amazing. I have never seen recipe like this before. Brown butter and butter cream, this must be the syrup of gods. I need to make this! I have never ever heard of buttermilk syrup but I am totally on board with you!! Especially since you added brown butter. Awesome! I’ve never had buttermilk syrup- I think I’ll skip the original and go straight to the brown butter version! wow, i’d be wanting to pour this on everything!! I am seeing brown butter recipes everywhere and keep meaning to try them. I am totally late to the party on that, but breakfast happens to be my favorite meal….and no good breakfast is complete without syrup. Looks yum! I just made homemade choc chip waffles this morning. I think I need to make this syrup. Do you think it would work with homemade buttermilk (milk with lemon or vinegar)? Brown butter makes everything better. It’s true. And I would totally jump onto a waffle that had this dripping all over it. I know buttermilk syrup is amazing. But your addition of brown butter will make it totally irresistible! Pinning! Looks like the perfect topping for our morning pancakes. This looks absolutely divine! 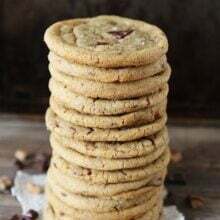 I love the nuttiness of browned butter and the tang of buttermilk, but I would have never thought to put them together. Ohh I bet this would be great over a panna cotta! I love Elf, too!! It’s hilarious. And I would definitely drink this by the gallon! This is simply brilliant! I would have never thought to marry these two fellows together. Can’t wait to get my pour on! I want to dip everything I own in this!!! Sounds so decadent + FUN! I didnt’ realize this was real either! I have to make this.– especially for Cole, he and I, LOVE ELF! I’m waiting for Wednesday to see what i can pour this over!!! I don’t know if I would pour this over spaghetti…but I definitely see myself pouring it over pumpkin pancakes this fall! Nothing better on earth than butter and syrup on waffles!!! I LOVE Elf too – funniest move ever, and I’m not even a Will Ferrell fan! I’m sure I’ll be a syrup lover after I make this too! I made this with honey instead of sugar, because I’m one of those people :), and it was delicious! Drinkable, with a straw, is an excellent description. Thanks for posting. Yeah, I’m pretty sure all I’d need is a straw! I totally have to watch Elf. Awesome shots! haha I remember that scene where he pours syrup on his spaghetti. I’d prefer this syrup on my pancakes though! This syrup looks heavenly! I loved that part of Elf–thanks for that memory. I’m frequently getting buttermilk marked down at the grocery store (I stalk sell by dates, I admit it) and this is an excellent idea when I’ve scored several jugs. Is the baking soda a necessary component? Help me understand it’s place in the recipe? It causes the syrup to bubble up and thicken. Baking soda is necessary- it has a chemical reaction with the buttermilk. Trust me you’ll love it. Is there anyway to make this and it Not separate, like a caramel sauce? 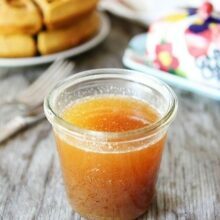 I love the traditional buttermilk syrup & I love browned butter so this is a no brainer- I must try this. It’s Just that I don’t like the separation after. Wondering if anyone has successfully had it come together more harmoniously? Hi there! My name is Jessica, and I run a food blog called Floptimism. Every week, I write a Weekend Wrap-Up where I share some of my favorite blog posts, recipes, and articles from the past week. I absolutely fell in love with this recipe – what a way to spruce up breakfast! – and wanted to let you know that I featured this post this week. I also included your giveaway/crispy burrito post, but didn’t want to leave a double comment over there. If you’re interested, I’ve left the link below. Thank you for such a beautiful post, and I hope you have a great rest of your weekend! Outstanding! Your directions are so easy. 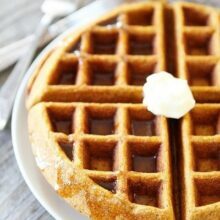 This was the first time making it so I wasn’t sure until I tasted it on pumpkin waffles. Simply Amazing. My husband who isn’t a fan of pumpkin waffles asked me to make these the rest of the week. This syrup just brings the waffles to a whole other level. Our family is in agreement that this syrup reminds us of sticky toffee pudding. I’m not sure if my butter was browned enough since I was using a dark pan, but it turned out great! A hint to get wonderfully clear browned butter is to pour it through a paper towel set in a mesh strainer (a coffee filter was too slow for us). All the sediment will be easy to toss, too! I’d never heard of buttermilk syrup, we used the browned butter on spaghetti and topped it with grated Myzithra cheese (think (Pasta) Factory). That is such a big hit, I’m sure this is fantastic, too! I made this and did half of the recipe and it was perfect on my cornmeal pancakes. Its best if you let it sink into the pancakes. This sounds great! But does anyone know why the recipe calls for baking soda? What purpose does it serve? This is so very AWESOME! It’s seriously going to change my life forever! Many thanks! I agree! It is so good! 2. Can I double or triple the recipe as long as I use a super big pot? It will separate, but heat it up and whisk it! It will be just fine! Yes, you can make a larger batch, but make sure you have a big pot…like you said! I made this syrup yesterday for Christmas Eve breakfast. I made the pumpkin waffles too! Both were AHmazing. i will definitely make both again. The waffle recipe made a lot; I froze the extras and I am looking forward to toasting them and enjoying them again. I would recommend doubling the recipe for the syrup. It isn’t enough for the batch of waffles. I am not a huge fan of maple syrup. This was soooo much better. Hello, french toast? What do you think about as a topping for ice cream? Interestingly, found it works better as a sauce with chicken & pancakes, rather than just pancakes on their own. The slight saltiness of the sauce compliments the chicken & pancakes together…. Will make some more sauce this weekend! I have fallen in love with Starbucks Cinnamon Shortbread coffee. Stay with me. I asked what iyer was made with and they did their brown butter cinnamon Shortbread syrup so I started googling and I found your recipe so I thought I would give it a try. OH MY GOODNESS! It is AMAZING in coffee! Now you can add coffee to your list of things to use this syrup for! Thanks for this recipe!